The other day I had the privilege and the pleasure to give a POE presentation entitled Runtime Code, a.k.a. Blurring the Distinction between Schema and Data, in the room behind this window at the Ace Hotel in Portland, Oregon. This entry was posted in Level: Advanced and tagged Evaluate, Get(ScriptName), GetFieldName, runtime code, XML on October 31, 2014 by Kevin Frank. Today we’re going to delve further into the concept of virtual calculations, picking up where we left off last time, and with the assumption that readers are familiar with the material in part 1 and part 2 . We’ll look at some ways to make this technique less brittle (prone to breakage if objects are renamed), and also less opaque to DDR analysis tools such as BaseElements and Inspector. We’ll also see if the technique can be applied to auto-enter calc fields, and finally, we’ll explore some ways to make the technique easier to implement. This entry was posted in Level: Advanced, Version: FM 12 or later and tagged Evaluate, FM_Name_ID, GetFieldName, Separation Model, Virtual Calculations on May 13, 2013 by Kevin Frank. In part 1 of this series, we defined radical separation as a separation model scenario in which the developer no longer has access to a data file once a solution had been deployed. Updates to the solution are delivered in the standard separation model manner: by swapping in a new interface file. We explored the concept of “virtual calculations”, where certain (unstored) calculated fields in a data file derive their definitions from syntax stored as data in a special table in the interface file. The advantage of this being that calculation logic can be redefined programatically by the simple expedient of replacing the interface file. This entry was posted in Level: Advanced, Version: FM 12 or later and tagged Evaluate, FM_Name_ID, GetFieldName, Separation Model, Virtual Calculations on May 3, 2013 by Kevin Frank. Q. What’s your experience with the Separation Model? A. I’ve used it heavily over the last seven years, for a variety of vertical market applications, custom projects and, recently, on a vertical market FMGo app. This entry was posted in ExecuteSQL, Level: Advanced, SQL, Version: FM 12 or later and tagged Evaluate, GetFieldName, Separation Model, Virtual Calculations on March 21, 2013 by Kevin Frank. Update 22 Jan 2013: Demo file and screen shots have been revised to fix bugs identified by Matt Ayres and David Schwartz (see comments at the end of article). Ever since I posted part 2 of this series, I’ve been torn between, on the one hand, wanting to move on to other topics, and on the other, the realization that I wasn’t quite done with this one yet. So, here is what I expect will be my final posting, and final demo (dynamic list sorting, v3 rev5), on this subject. Thus far, we’ve looked at various methods to facilitate dynamic list sorting (by “dynamic” I mean that the field to be sorted is determined programatically). Most of these methods use two fields — one of them uses four — and you can see them all in part 2. But in the back of my mind has been the knowledge that Ugo Di Luca pulled this off with a single field back in 2004 (EasySort.fp7, shared by permission of the author, and previously discussed last April in an article entitled Portal Sorting, pt 3). This entry was posted in Level: Intermediate, Version: FM 10 or later and tagged Conditional Formatting, FieldType, GetField, GetFieldName, MiddleWords, Substitute on October 1, 2011 by Kevin Frank. Well, I thought I’d said everything I had to say on this subject, but yesterday afternoon I noticed a glaring omission in part 1’s demo — what happens if the user manually unsorts the found set? This entry was posted in Level: Intermediate, Version: FM 10 or later and tagged Conditional Formatting, FieldType, GetField, GetFieldName, MiddleWords on September 22, 2011 by Kevin Frank. Earlier this year, I posted a three-part series on Portal Sorting, and part 2 focused on dynamically sorting a portal when a column heading was clicked. 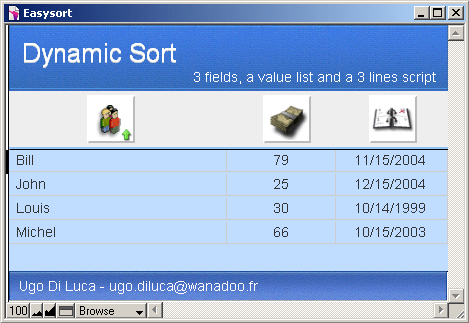 Well, with just a few tweaks, this technique can be applied to dynamic sorting of found sets, and of course the most likely place to employ something like this would be on a list view. I should note that on very large found sets, sorts using this technique can be noticeably slower than traditional “hard-coded” scripted sorts. (Performance is fine with normal found set sizes.) The benefit of using this technique, is that a new field can be added to a layout and sort-enabled in about 60 seconds without touching the script itself. This entry was posted in Level: Intermediate, Version: FM 10 or later and tagged Conditional Formatting, FieldType, GetField, GetFieldName, MiddleWords on September 17, 2011 by Kevin Frank. Update 28 April 2014: Make sure to read the illuminating comments following the article, with various suggestions to make your code even less brittle. The other day I was working with an OnRecordCommit script trigger — let’s call it “Trigger Script” — and, not surprisingly, I wanted this script to run whenever a record in a certain table was committed. Except… well… not exactly always… you see, there was this one other script— let’s call it “Other Script” — which had a Commit Record step right smack in the middle, and in that particular circumstance I definitely did not want Trigger Script to execute. This entry was posted in Level: Intermediate, Version: FM 10 or later and tagged Get(ActiveFieldName), GetFieldName, Internal IDs on April 18, 2011 by Kevin Frank. This entry was posted in Level: Intermediate, Version: FM 10 or later and tagged Conditional Formatting, FieldType, GetField, GetFieldName, MiddleWords on April 7, 2011 by Kevin Frank.